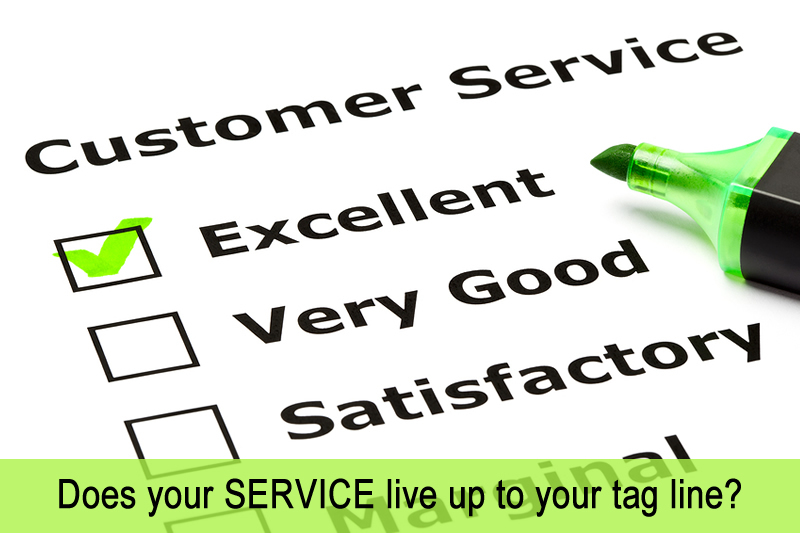 Does Your Service Live Up To Your Tag Line? Blog Does Your Service Live Up To Your Tag Line? A month ago my business networking group decided that we should all run a charity 5K together and that it would be even more fun if we had team shirts with our group name and logos on it, like the real running shirts you get in races. We decided to get something nice, not one of those cheap throwaway tees but a sports tee that we could be proud of and wear again and again. I took the action to create the shirts and after having one of my talented graphic artists come up with a snappy looking design, I selected Logo Sportswear to do the printing. Their tag line is “Our Competitive Promise! We are committed to offering the best service, at the best price! We will beat any published competitive quote. ” Sounds promising? Sadly it didn’t turn out to be and there are some very important lessons here for your business. Sadly, at one point this company was probably founded by someone who really did care about service. They thought enough about it to create a service oriented tag line. I have to believe that if the Logo Sportswear founder knew how customers were being treated, he or she would not be pleased. Rewind four years ago to a few hours prior to my daughter’s 8th birthday party. I had ordered the cake and food from Whole Foods in Coral Gables. For anyone who has organized a birthday party for an 8 year old you’ll know just how stressful the morning before the party tends to be. Imagine my reaction when I arrived to pick up my order and was greeted with, “um, what order?”. Panic!!! I admit I was not my most mature self at that moment and the manager at Whole Foods certainly got an earful. He could have taken several paths at that point, including a simple apology or a gift certificate, but that would have done nothing to resolve the situation of 16 children and their parents waiting back at our place for food and cake, which of course had to have a particular theme. So what did he do? He unleashed all of the forces at his disposal to rectify the situation, including having his team scramble to make platters, pizza AND call the pastry chef who rushed to work in her jammies to bake, decorate and then later even personally delivered the cake to our party! And as the manager was helping me to my car with the food and I handed him my credit card, he turned it away and said, “I’m sorry, this was completely our fault and there will be no charge.” Now that is what I call WOW service! And the result? In the past four years I have personally spent thousands of dollars with Whole Foods and have told this wonderful story of caring service countless times, including to you here. The goodwill and referrals generated by the choice that store manager and his team made that day have returned far more than it ever cost in food and will continue to generate even more goodwill as you share my story with others. Logo Sportswear on the other hand, is not only on my list of companies to never do business with again, but I will probably tell even more people about how they left me hanging on an important order and how if I were you, I wouldn’t trust them with your business. So how can your business be more like Whole Foods and less like Logo Sportswear? When the founder can no longer be involved in every transaction, his or her expectations of service can only be maintained through processes that call out for attention if a service expectation is about to be missed, clear performance expectations and reviews, empowering your team to do the right thing for your clients and reinforcing these messages through training. When working with a client our role is to set these processes in place so your commitment to service is more than just a tag line.